The new AirPods aren't really the AirPods 2, are they? I was 'lucky' enough to be one of those to get their hands on the first AirPods when they launched in 2016. I landed back in the UK from the Apple launch, and had to head straight to an event where there would be many music journalists present. I popped them in on the street, and was instantly embarrassed by what people would be thinking about me. At the event, multiple members of the music press were intrigued, trying to work out whether these new headphones from a brand like Apple were any good. Remember, true wireless headphones were in their infancy at this point, the Cupertino brand forced to bring out something flagship to offset the loss of the headphone jack on the iPhone 7. Fast forward a couple of years, and it seems like every third person is wearing them. The high-quality microphones are good enough to have a conversation on the phone with. The pillbox-like carry case is instantly recognizable. Society has accepted people wearing AirPods readily - a complete change from the eyes I felt boring into me when I wore the wireless headphones outside for the first time. So here we are, on March 20 2019, with new AirPods, two and a half years after the first iteration came out. We've been watching the interest in 'AirPods 2' steadily rise for the last year or so, as people wonder when Apple is going to bring out the new and improved versions of one of its most popular products. After all, this is a brand that's made its name on a phone that gets refreshed every year without fail - so while there's not been any real need to bring out new versions of the white headphones, people have been wondering when they'll be appearing, in line with their annual expectations for new hardware. Now that we've finally got new versions, there will be some who are disappointed in the lack of huge upgrade - it's iterative, rather than relaunching the concept with all new features. They're the AirPods S, rather than the AirPods 2. (At this point I just want to say yes, we are calling them AirPods 2 in our coverage - but that's how they're being spoke of colloquially, and it's the simplest way to differentiate at the moment). There's clearly a space that an 'enhanced' set of AirPods could move into. Apple's had over two years to noodle away at its wireless earbuds, and what it's brought is a more advanced chipset inside for better battery life and connectivity, a wireless case and a pervasive Siri assistant that can be chatted to without physical touch. That's not really a sequel, is it? It seems to be that this is a stopgap upgrade, something that keeps the headphones performing closer to the competition while doing enough to keep consumers interested. If we follow the model of the phone launches, it means that Apple is likely holding something back for the launch of the 'true' sequel, the real AirPods 2 that cost more but offer real material upgrades. When the iPhone 6S emerged looking similar to the iPhone 6, the world wondered what the iPhone 7 might bring in terms of big changes. If you look at the rest of the true wireless earbud market, you're seeing either a race to the bottom in terms of cost, or more features being thrust in: accelerometers, gyroscopes, heart rate monitors, longer battery life and enhanced sound quality to complement the innovative idea of no wires in sight. Apple is clearly aware of this if the patents it's filing are anything to go by: cancelling vibrations when talking on noise-cancelling headphones, and biometric / fitness monitoring added into the mix to really enhance what Apple's headphones can actually do. There's the interest there, the desire to research making headphones that offer more than just the capability to listen to music and answer calls without needing to whip out the phone. That's where the feeling that Apple is holding back is coming from - you'd expect that if there were, truly, a sequel unleashed on the world that there would be a few more tweaks added in. The biometric tracking would make the AirPods great for fitness - they're already loved by many for running and workouts thanks to shedding the wires, but they're not the most snug of fits so an enhanced grip would be really beneficial. Like the Apple Watch 2, the desire to create something for the fitness fans can often come a bit later - there was no need to avoid GPS in the first iteration of the Watch, but it offered a timely and useful upgrade when it launched in later models. New colors would be a nice touch, and an improved audio experience seems a nailed-on upgrade that everyone would enjoy - the fact we haven't had any word from Apple about the improvements to the sound quality on the new AirPods speaks volumes. With two years to develop, as well as integrating the Beats team into its research and development team, you'd expect rapid audio improvements, but Apple is perfectly content with the output from its AirPod range - again, it would be something to add into the 'proper' AirPods 2 (or AirPods Series 2 as they could well be called). All that would just be Apple doing what the rest of the market is attempting to achieve - it doesn't even take into account the possibility of what one of the world's largest companies could do to push the envelope of the wireless earbud. A set of AirPods that connects via its own data connection to Apple Music, anyone? There's clearly a space that an 'enhanced' set of AirPods could move into - so the fact Apple hasn't done so means the AirPods 2 looks nailed on for the future. 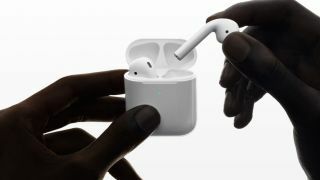 Well, we've covered the various rumors surrounding the AirPods since before the first models were announced, and noted Apple analyst Ming-Chi Kuo suggested that 'a major upgrade' is on the way in 2020. He predicted the latest upgrade would be minor with wireless charging, so it seems pretty likely that a larger change would be about a year away. If that's the case then that's when we'd expect the AirPods to be upgraded with biometric sensors and a better sound quality, along with a more robust fit. Given the AirPods are relatively crucial to many Apple products (the Apple Watch, the jack-less iPhones and even the MacBook range all use their seamless pairing to make the AirPods the easiest on-brand headphones for Apple lovers to use) it makes sense that Apple would keep plugging away at improving them. So if you were looking forward to the Apple AirPods 2, then the recent launch might not actually be for you. The new AirPods 2019 are certainly an upgrade, but if you're looking for a true, material upgrade for Apple's stem-toting headphones, then that could well be coming down the line. Original AirPods vs AirPods 2 - what's the difference?